Its been really really dry, no rain for us, although some in our area got some good storms, we missed out completely, so no rain in February at all, and its usually our wettest month. On top of the lack of rain, we've had more high temperatures, so the evaporation rate has been terrible, our paddocks are painfully dry and brown. We have stepped up our drought plans and I'm actually feeling less stressed about it now we've made some management decisions. We've decided we just need to sell our Braford cattle before we run out of water for them, and keep buying hay when it comes available, so we can keep our house cows going. We are going to kill the big steers as early as possible, so there's more feed for the others. I've got Donald advertised for sale, but he's not exactly in demand so far! Anyone want to buy a friendly Dexter bull, we can deliver? At least now that some other areas have had some rain we might have a better chance of selling our cattle (lately the market has been flooded with people needing to move cattle off their droughted properties). We are not in the terrible situation that full-time farmers are facing, either keep paying to feed stock (and get in more and more debt) or try to sell (but its not easy to sell them if they are skinny) and have to buy stock back when the rain comes and they are 10 times the price. How anyone makes any money out of farming beats me! We are hobby farmers with off-fram income, so we can make some decisions to save our sanity and settle with losing a bit of money on our investment. 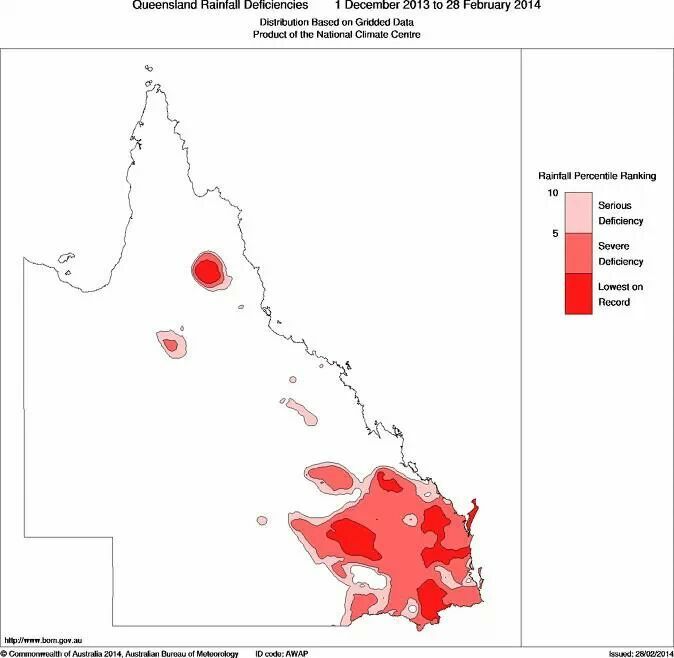 Just to prove that I'm not imagining it, here's the official map, we are in the dark red blob near the east coast, either that or the dark pink, which means we either had lowest on record or 5% of our normal summer rainfall. Buy beef and lamb, we need to keep these animals moving through the meat-works, otherwise farmers are having to shoot animals that are too skinny to travel, and they would much rather get some money for them and see the animals at least used for something, so keep buying meat! Don't buy hay unless you have to, if its for your garden, please leave it for a while, let the farmers have the hay, they need it, its getting hard to find. Donate to Aussie helpers, they are giving out hay and groceries to farmers in need. The chickens and guinea fowl are roaming around finding anything green they can (including my garden). The first round of chicks are getting bigger (and only 9 of them is a managable amount compared to 30 last year! ), and we hatched 11 more chicks and 7 guinea keets (I already sold the first 7), does anyone want to buy some guinea keets?? Molly had her calf Ruby early in February, and Pete has done a great job looking after them and milking daily, one good thing about the dry weather is she's not making as much milk as last year! Molly is producing 6L a day and is a perfect lady in the milking bales. Pete made a wonderful cheese, and we've been making yoghurt, kefir and cream cheese. Even with dry grass Molly makes lots of cream, so we'll be making ice cream soon too. AND I forgot to tell you last month that my article about calves and cows was published in the Jan/Feb Grass Roots, Miss Molly was even featured on the back cover, she's a celebrity cow now, but it hasn't gone to her head....Here's our lovely cows with their calves tucking into a lucerne round bale. In the kitchen, here is my helper ready to clean up any scraps or spills, she stays out of my way, but she's on alert! I'm getting better at making bread, love the sunflower and chia combination. We are making lots of kefir and I've started some fermented cucumbers from the 2 massive cucumbers we've harvested so far (I wrote about the garden here). And we bought 2 kg of garlic and already dried 1 kg to make garlic granules, we are just finishing the ones we made last year, so they've been really good and we didn't ahve to buy any chinese garlic when the Aussie stuff ran out. Do you want to guest post about permaculture? I've had a few amazing volunteers already, please join in if you would like to share your experience with permaculture, we are all learning together! How was your February? Any plans for March?